Again today volunteers and sheriff’s officers will be searching for . Twenty to Thirty trained search and rescue personnel including Southern Humboldt Technical Rescue and Humboldt County Sheriff’s Posse, and the California Rescue Dog crew and others expect to expand their area of search today. There is even hope that an airplane might be brought in to cover greater area. This morning crews are meeting at the command area near Renners. They are expected to once again search the area by Evergreen as there was a report of Mr. Firestone being seen on the road there 9:30 Monday night. But they will be expanding their search outwards in hopes of finding him. Yesterday, family members as well as trained volunteers and professionals searched for the missing man who is described as a white male, five feet, 8 inches tall, 125 pounds with gray hair and brown eyes. He may also be wearing a long gray raincoat and a white round fishing cap. If you have any information contact 923 – 2420 or 223 – 2800. Also the Search and Rescue crews will be working close to the road. Many aren’t wearing uniforms. Please SLOW DOWN when passing them or any others near the roadway. The Search and Rescue crews searching for the missing man Robert Firestone have requested a helicopter because the search has not been fruitful so far. The unit is expected to begin flying in the next hour. It will be close to the ground. Please do not be alarmed. This helicopter has a variety of different instruments to help locate the missing man. The latest sighting known of Mr. Firestone as of this time was in front of The Hemp Connection at 11:30 Monday night. 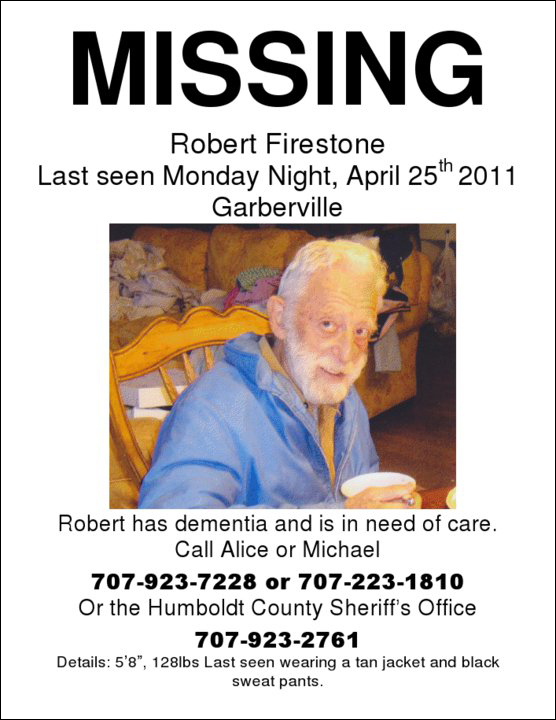 A BOLO (Be On the Look Out) for him has been extended throughout Humboldt and Mendocino Counties in case Mr. Firestone accepted a ride hitchhiking. “Our time is running out …,” says Diana Totten. She urges everyone to report any information and to be tolerant of the flying helicopter. 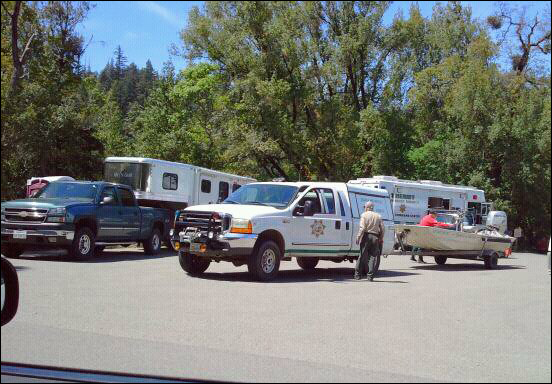 The local search and rescue teams and the Sheriff’s department posse are packing up and heading home after searching for two days for Robert Firestone, an elderly man. “We’ve done a really thorough search but patients with dementia don’t follow a set pattern,” says Diana Totten a member of Southern Humboldt Technical Rescue. “We’ve walked every stretch of road from Dean Creek to Benbow….They’ve brought in helicopter and boat to look everywhere….We’ve exhausted our leads.” But then she added that she personally was still looking as of 4:30 this afternoon in the Kimtu area. Totten says that the hope is that Mr. Firestone has “caught a ride with someone…He has gotten in cars with people before and just rode off.” He does have identification as his wallet is missing, too. The Sheriff’s Dept is expanding their search by notifying police and hospitals through out the North Coast so that they can be actively looking for him outside of the immediate area. As our ground search has not led us to Robert or any other leads, we will be extending the search nationwide through law enforcement. Also the new posters will be going up all through Humboldt and Mendocino counties. Our search strategies change as the information and searchers reports are compiled. We have searched the likely places in the Garberville – Redway area the best we can with dog teams as well as search and rescue teams. We can never check everywhere but feel we did what we could within reason. We will still follow any new lead or info. and our hopes are that he will show up and tell a story of great adventures. If anyone has info please call 911 or the local numbers that are being posted. Our community has given a lot of good leads so far and hope that continues. I hope everyone in Garberville is looking around their own homes for this missing man, he could be in a back yard or on the side of your home, lost and confused. Years ago in So. Cal. A older gentleman was lost and confused and ended up in our back yard thankfully a neighbor saw him in the a.m. and called us, he had been there all night. Please take a walk around your yards and look. Thanks. Diana Totten: We have been getting new info throughout the day which really helps.Thank you. Its like a puzzle with many pieces, so when people are able to give a piece of the puzzle, it helps us put the whole picture together. Thanks again. This entry was posted in Missing Persons and tagged California Rescue Dog Crew, Diana Totten, Facebook, helicopter, Humboldt County Sheriffs Posse, Kym Kemp, missing, Robert Firestone, SoHumAwareness, Southern Humboldt Technical Rescue. Bookmark the permalink.